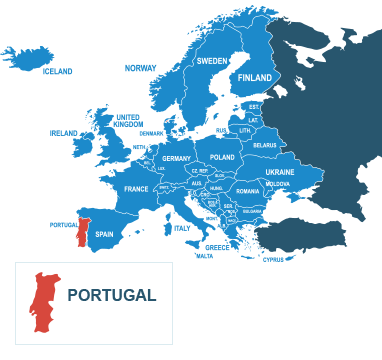 With our trusted network of European parcel couriers, sending a parcel to Portugal is easy with DPD Local Online. Boasting 850km of spectacular coastline, 3000 hours of sunshine per year, and mild winters, particularly in the Algarve, it’s no wonder that Portugal is home to a high number of British expats. For this reason, Portugal is a very popular place to send a parcel for thousands of UK senders. Finding out how much postage to Portugal will cost you is easy with our range of express and economy parcel delivery services at your fingertips. Our extensive parcel delivery network, as well as our expertise in international courier delivery, also means that we can arrange getting your parcel to Portugal in the most efficient and safest way possible. Sending your parcel to Portugal with DPD Local online means that your package is in safe hands, so book your postage to Portugal today with our easy-to-use online form. Delivery within 4 working days. Do I need to deal with customs when sending from the UK to Portugal? As Portugal is a member of the European Union, you won’t need to carry out customs duties on parcel deliveries to Portugal from the UK, making things a little less stressful for you. How much does it cost to send a parcel from the UK to Portugal? Postage to Portugal costs as little as £16.00 when you DPDLocal-Online. Our prices are so much better than everyone else’s simply because we are able to negotiate with our couriers for the cheapest parcel delivery to Portugal, which we provide for all of our customers. We cut down prices, not quality of service. How should I address my parcel for delivery to Portugal? There are a couple of things about the Portuguese addressing system that sets it apart from the typical European model. For instance, Portuguese post codes have seven digits (rather than the more popular five or four digits of surrounding countries) separated by a dash, like a US ZIP code. Luckily, the Universal Postal Union have produced this handy addressing guide to ensure that addressing a parcel for Portugal isn’t confusing, so you can ensure it gets from A to B with no trouble along the way. For a full breakdown of what is or is not permitted in deliveries to Portugal, get in touch with HM Revenue and Customs before sending your parcel. You can also check out our prohibited items list for items you can’t post in the UK.